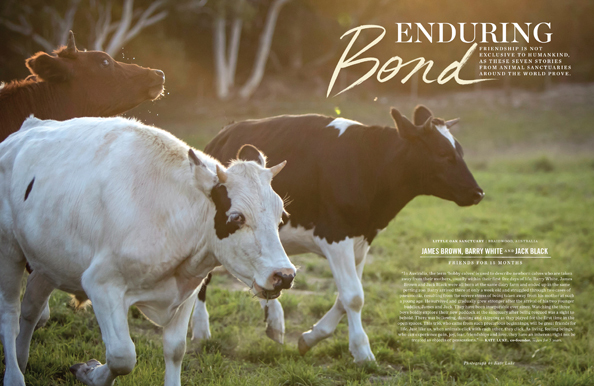 Perhaps the most remarkable feat of the animal agriculture industry is the distance at which it has kept the public from its massive killing apparatus. 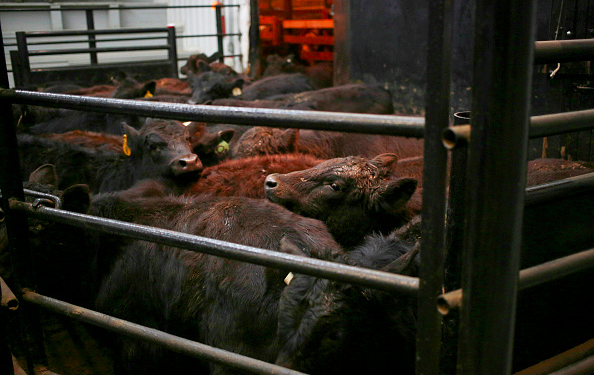 Despite the fact that hundreds of millions of animals are slaughtered every single day for their meat in this country, most of us have never witnessed a single instance of this violence. 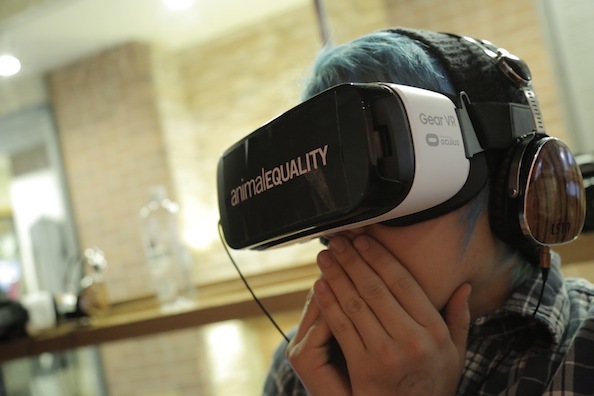 The non-profit organization Animal Equality aims to change this, with the help of virtual reality. 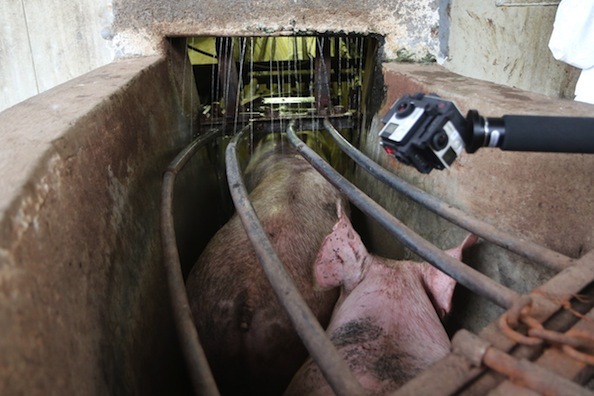 In its new VR documentary film called Factory Farm, which is part of its iAnimal project, the organization’s cofounder Jose Valle leads viewers through the final moments in the lives of several pigs in a factory farm and slaughterhouse in Mexico. The film made its public debut at the Sundance Film Festival in Park City, Utah, earlier this month. A Sundance attendee watches the “Factory Farm” video, during which they can move around and get a 360° view of a slaughterhouse. Factory Farm, produced in collaboration with VR technology company Condition One, is not easy to watch. 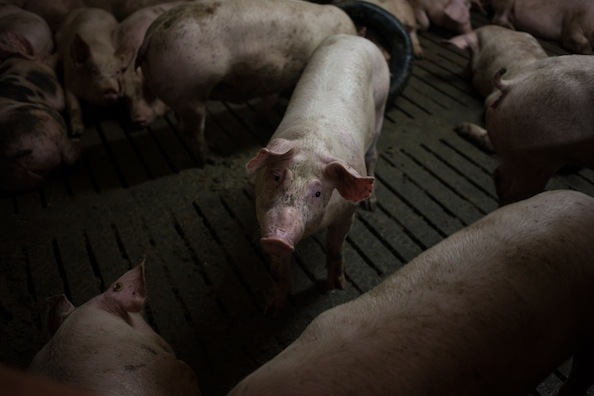 It puts viewers just a few feet from not only the horrific conditions these animals are subject to, but also the stun-and-slaughter process, as they bear witness to what is an extremely common outcome: pigs regaining consciousness just moments after the initial stun, left to writhe and suffer as they bleed out on the slaughterhouse floor. 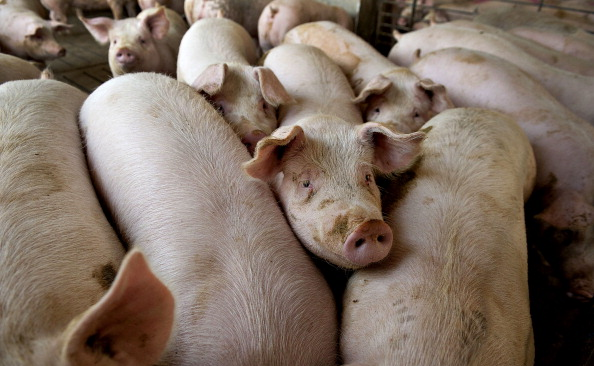 Pigs funnelled to slaughter at a plant in Mexico. Photo courtesy Animal Equality. The film is narrated by Valle, who worked for months building the contacts and relationships to get access to the Mexican facility. (A level of transparency that, it’s worth noting, would never be possible in the US, due to the industry’s colossal, ongoing effort to prevent the public from seeing where its meat comes from.) Valle used a custom rig built with six special cameras to film the footage, which was later stitched together to create an immersive, 360-degree video. The viewer is able to behold their grim surroundings, from floor to ceiling and all around, in full, stereoscopic 3D. We sat down with Valle and his Animal Equality cofounder Sharon Nunez to talk about their Sundance experience and how virtual reality will shape animal rights activism. What did showing iAnimal at Sundance teach you about the potency of virtual reality? 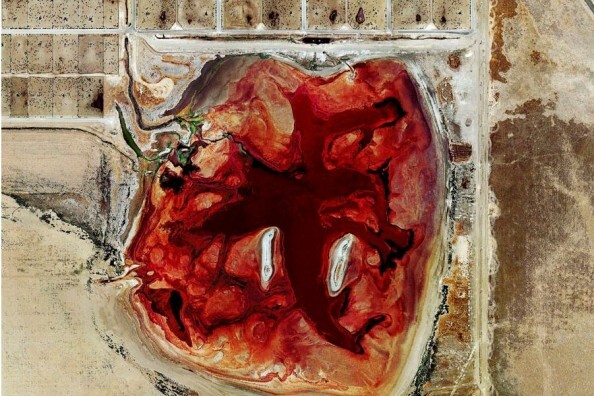 Sharon: Even though it was a 12-minute video — a very intense video — of a factory farm and a slaughterhouse, most people watched through the whole experience. 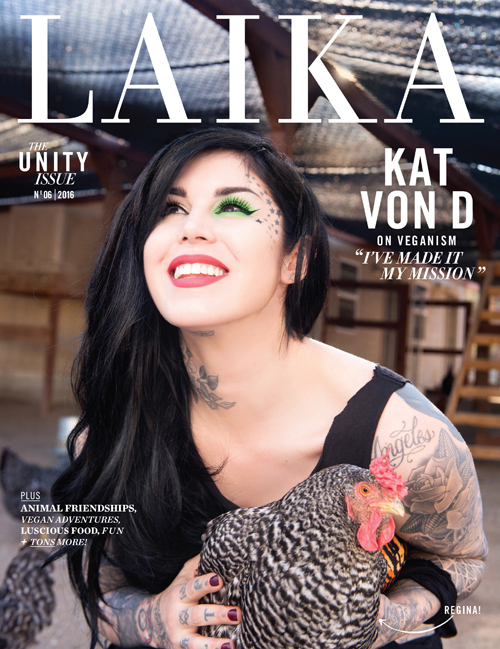 A lot of people commented about how powerful the footage was, and many commented about eating less meat or even going vegetarian or vegan. It is important to note that this was one of the most talked-about pieces at Sundance. One of the key learnings for us was that when people are immersed in VR, they are ready for something transformative. 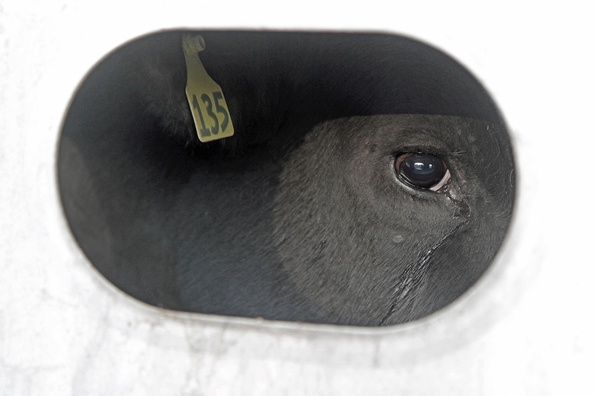 We give them that through access to all these horrible places where animals are suffering and are slaughtered. 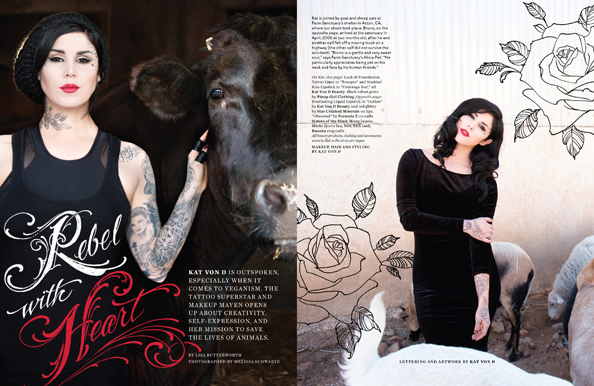 And this actually has the potential to not only change their lives, but to change the lives of millions of animals. Were you surprised by people’s willingness to watch the film at Sundance and their reactions to it? Jose: Yes, because we told them that it was going to be an intense experience, it contains some very graphic scenes. One of the challenges was, how can you convince or invite people to watch something that is going to be painful, something that is going to be difficult to watch. It’s like asking someone, “Do you want to suffer?” And no one wants to suffer. But people were actually eager to watch it, and virtually everybody who watched it thanked us for producing the piece. Word-of-mouth worked really well, and we found that many people were also bringing their friends, co-workers or even families. They even drove from Salt Lake City to Park City specifically for that video. We filmed many of their reactions, which speak for themselves [in showing] how impacted they were. It’s not a video that you finish watching and you can just move on to the next thing. What we found is that people needed to process what they have just witnessed and they needed to talk about it and they needed answers. 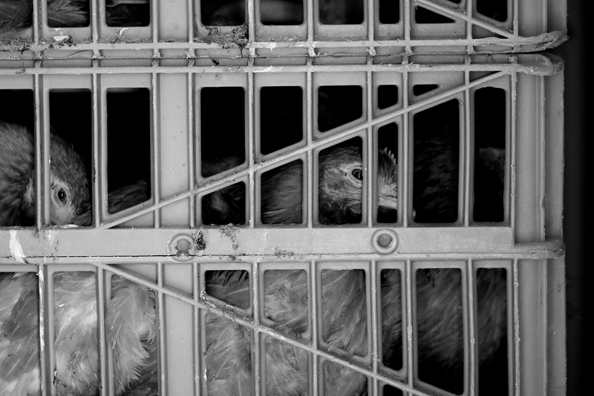 If you look in the other direction, you are still inside that cage, just as the animals are. The life of a pig on a farm. Photo courtesy Animal Equality. Many people have seen undercover footage, but VR is something new. 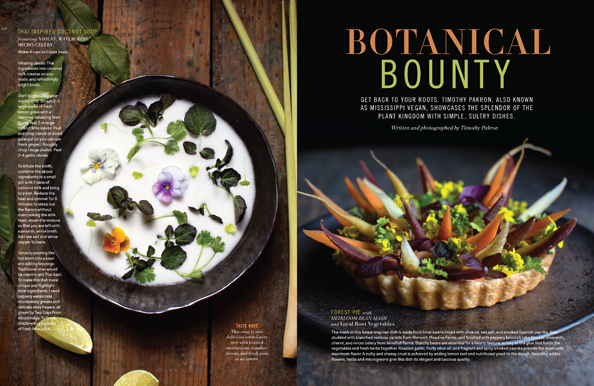 What makes this kind of sensory experience so life-changing and so vital to the animal liberation movement? Jose: Virtual reality has the power to bring you into these places where you are not supposed to be. When we learned about this new technology, we understood that. We started experimenting, putting cameras inside cages — so when the viewer sees that [footage], [it’s as though] they are the ones who are trapped inside the cage and everywhere they look, there is no way out, as animals don’t have a way out. 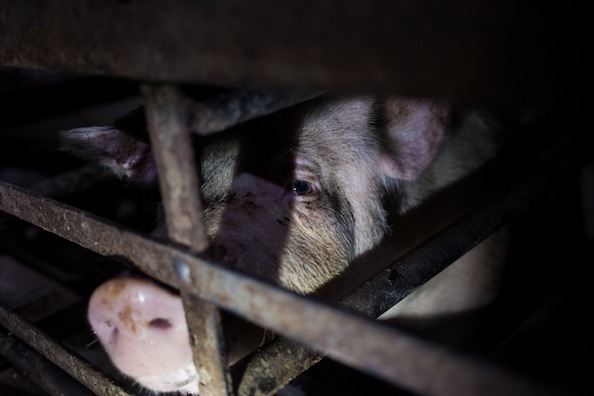 If you look in the other direction, you are still inside that cage, just as the animals are. So I would describe it as a very powerful [way] of people being witness to what happens and feel like you are the one subjected to the same treatment as the animals. Sharon: We feel that VR is an extremely important tool for activism. We think it’s really revolutionizing empathy and the capacity [for] people to empathize with others, human or non-human. When we want to make sure that a person is transformed or we want to maximize the possibilities we have with engaging a person, changing or inspiring that person — VR is our tool. We want to continue developing content for VR inside farms and slaughterhouses and other animal exploitation facilities. And we want as many people as possible to try this out. That is why we are planning to bring this to universities, to festivals, we are to planning to bring it to politicians, to companies. And we think it’s really going to make a case for animals and their suffering. How do you envision making this cutting-edge technology accessible to a large number of people? Jose: Whenever we have shown this video with virtual headsets to people, we find ourselves surrounded by [other] people who are really interested in [trying it]. So we know that we have that on our side. We are bringing iAnimal to universities all over the U.S., Germany, Italy, England, and Spain. We are launching a website that will allow users to visit, virtually, a farm and go from one of the gestation crates to the slaughterhouse, look around and discover more information. We are also producing an app that will allow anybody, in any part of the world, to download [and watch] those same videos with a virtual headset like Google Cardboard, [which] we’ll be providing. People will be able to see it and show it to their friends and family and coworkers. We will also share it with other animal organizations who can use it as an awareness tool during their activities. Images courtesy of Animal Equality.